IBM WebSphere Remote Server V6 delivers a fully-integrated platform that helps manage remote environments such as retail stores and branch offices. It is a key component of the Store Integration Framework and on demand operating environment. This infrastructure offering extends IBM Enterprise Business Integration technology to distributed locations. WebSphere Remote Server helps retailers to manage their business more cost-effectively, increase employee productivity, and create a unique shopping experience for their customers. Employees have better access to customers, products, and sales information, thereby increasing productivity and providing better service to customers. 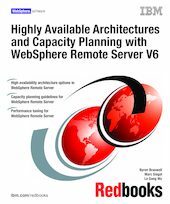 This IBM Redbooks publication introduces highly available architectures using IBM WebSphere Remote Server, capacity planning for store environments, and performance tuning for operating systems and WebSphere Remote Server. It can help IBM Clients and Business Partners integrate these tools into enterprise retail environments. The highly available architecture scenarios and the performance and tuning scenarios were developed and documented in a WebSphere Remote Server V5.1.2.1 environment. This book also discusses the underlying and related technologies, including the installation and configuration processes. In addition, this book will help you configure and optimize the new release of WebSphere Remote Server V6 in an IBM Retail Environment for SUSE Linux V2 environment.